According to plate tectonics theory, Earth’s outer shell is divided into multiple plates that slowly glide over the mantle. This slowly changes Earth’s surface over time by merging, or separating, continents. In the next few million years, Australia is predicted to shift north. In fact, the Australian plate is the fastest continental plate on the planet, moving northwards and slightly to the east by about 7 centimeters (about 2.7 inches) each year (the fastest plate overall is the Pacific Plate, which is moving to the northwest at a speed of between 7 and 11 centimeters or about3-4 inches a year). The continent is moving so fast that GPS can’t keep up with that movement: it has shifted by 1.5 meters (4.9 feet) since the last adjustment was made to GPS coordinates in 1994. To fix the problem, the Australian government has announced that the country’s latitude and longitude will officially be updated to reflect the continent’s new position. In about 20 million years, Africa and the Arabian peninsula will be merged. The Red Sea (Erythraean Sea) will be vanished. Around 30 million years from now and the Black Sea will also be vanished, as Anatolia (also known as Asia Minor) is moving to the north. 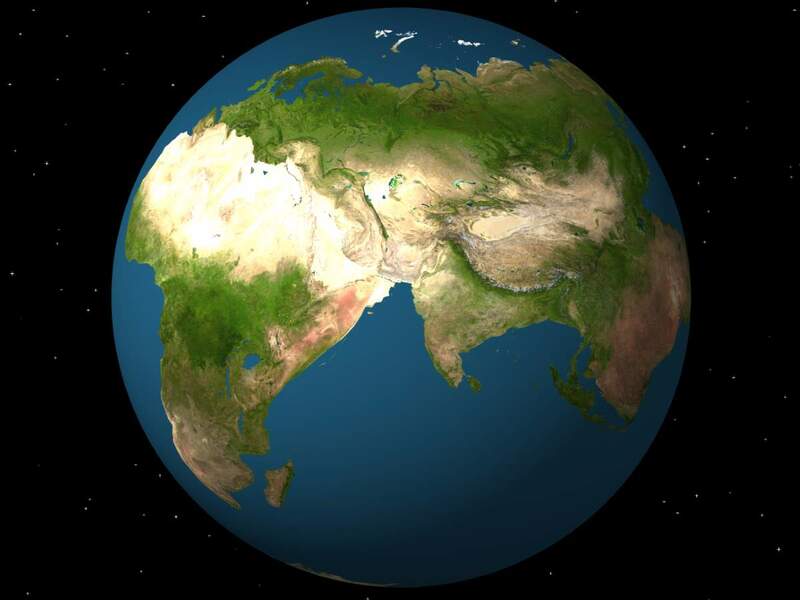 Around 50 million years from now, North America is predicted to shift slightly west and Eurasia would shift to the east, and possibly even to the south, bringing Great Britain closer to the North Pole and Siberia southward towards warm, subtropical latitudes. Africa is predicted to collide with Europe and Arabia, closing the Mediterranean Sea (completely closing the Tethys Ocean -or Neotethys- and the Red Sea). A long mountain range would then extend from Iberia, across Southern Europe (the Mediterranean Mountain Range) into Asia. Some are even predicted to have peaks higher than Mount Everest. Similarly, Australia is predicted to beach itself past the doorstep of Southeast Asia, causing the islands to be compressed inland, forming another potential very high mountain range. Meanwhile, Southern and Baja California are predicted to have already collided with Alaska with new mountain ranges formed between them. 120 million years in future and Antarctica is no more a frozen continent now. It is is expected to shift upwards. About 150 million years from now, the Atlantic Ocean is predicted to stop widening and begin to shrink because some of the Mid-Atlantic Ridge will have been subducted. In this scenario, a mid-ocean ridge between South America and Africa will probably be subducted first; the Atlantic Ocean is predicted to have narrowed as a result of subduction beneath the Americas. The Indian Ocean is also predicted to be smaller due to northward subduction of oceanic crust into the Central Indian trench. Antarctica is already collided with Madagascar and Australia, enclosing a remnant of the Indian Ocean (called the Indo-Atlantic Ocean). When the last of the Mid-Atlantic Ridge is subducted beneath the Americas, the Atlantic Ocean is predicted to close rapidly. Pangaea Ultima. At 250 million years in the future, the Atlantic is predicted to have closed. North America is predicted to have already collided with Africa, but be in a more southerly position than where it drifted. South America is predicted to be wrapped around the southern tip of Africa, completely enclosing the Indo-Atlantic Ocean. The Pacific Ocean will have grown wider, encircling half the Earth. According to the Pangaea Ultima hypothesis, the Atlantic and Indian Oceans will continue to get wider until new subduction zones bring the continents back together, forming a future Pangaea. Most continents and microcontinents are predicted to collide with Eurasia, just as they did when most continents collided to Laurentia. A major plate or main plate is any plate with an area greater than 20 million km2. The supercontinent cycle is the quasi-periodic aggregation and dispersal of Earth’s continental crust. There are varying opinions as to whether the amount of continental crust is increasing, decreasing, or staying about the same, but it is agreed that the Earth’s crust is constantly being reconfigured. One complete supercontinent cycle is said to take 300 to 500 million years. The most recent supercontinent, Pangaea, formed about 300 million years ago.